The Great Picnic — MARK REIGELMAN. 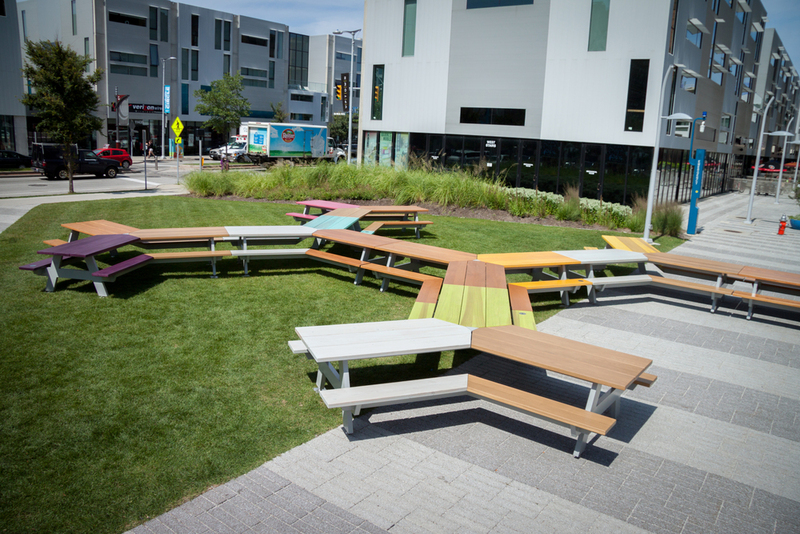 The Great Picnic is a modular table designed by Brooklyn based artist Mark A. Reigelman II for the Putnam Collection of Case Western Reserve University. Picnicking has been fundamental to the enrichment of American social fabric. The Great Picnic is a modular table designed by Brooklyn based artist Mark A. Reigelman II for the Putnam Collection of Case Western Reserve University. Picnicking has been fundamental to the enrichment of American social fabric. And for decades the picnic table has been paramount to this en plein air interaction. 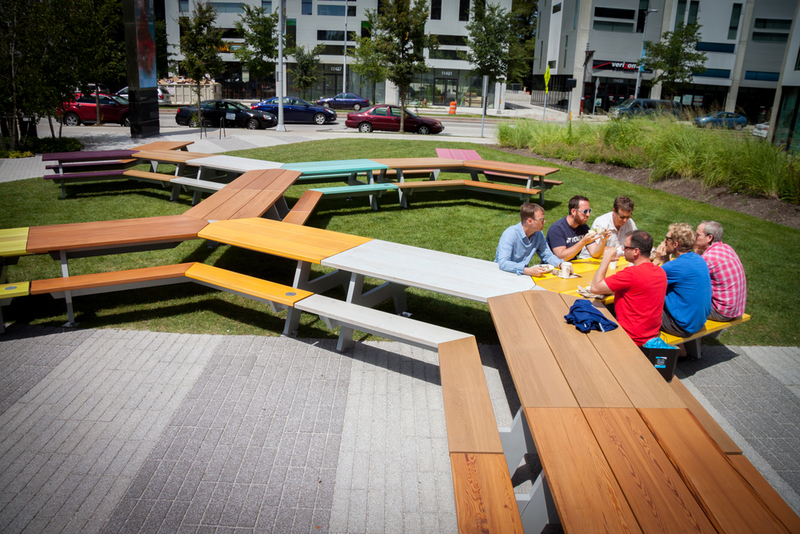 Today the simple and iconic wood structure of picnic tables highlights a convergence of people and ideas. It is a point at which family, friends and total strangers come together to discuss, debate, laugh, cry, yell, whisper, support, critique and most importantly eat! 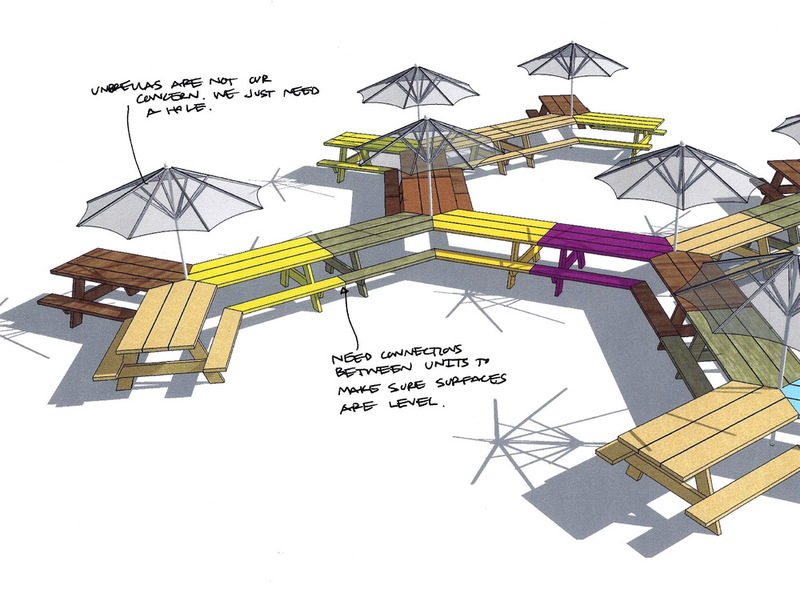 The goal of The Great Picnic was to create a modular unit that reflected conceptually the confluence of people and ideas that picnic tables encapsulate. Through subtle shifts in form, color and material The Great Picnic highlights this intersection while still retaining the identity of this simple structure. The Great Picnic was made possible by the generous contributions of The Cleveland Foundation and Toby Devan Lewis while the project was fabricated by Communications Exhibits Inc.